As we all gear up for a week filled with endless nights of backyard barbecuing. It can quickly become a bit overwhelming for both the host and guest alike. What do I bring? What do I need to prep? Fret not, here are a few things you can do to take the pressure off and have a good time. 3. What you plan on making? 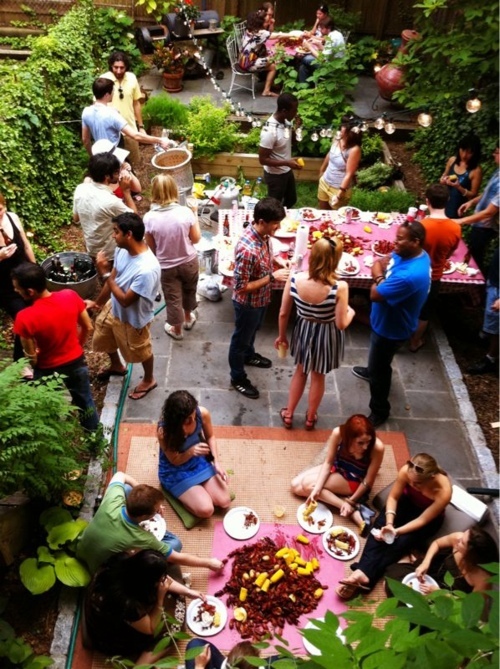 I love the idea of the crawfish boil like the image above. No. 2 Set-up the space the day before and remember these four main elements. 1. Seating: do t be affairs to being the indoors out if you have limited seating options. If the weather is nice, create an outdoor living room using chairs, side tables, and ottomans from inside. 2. Lighting: If you don’ have outdoor lighting options consider investing in a few strands of bistro lights, paper lanterns, or take the lamps from inside the house and use the to set-up an outdoor living room. 3. Bugs: Pick-up a few cans of bug spray to place on the tables. No. 3 Don’t be afraid to ask for help! Look at your lists and see what you can have friends pick up to help you out. Have someone pick up the condiments, soda, or chips and dips. No.1 RSVP!!!!! Let the host know your are coming, ask them if they need help with anything, and let them know ahead of time if you plan on bringing a guest. No.2 If you are brining a side dish, keep it to something you are comfortable making, assume you won’t have time to reheat or freeze it once you arrive, and remember it will most likely be sitting outside for an extended period of time. Checkout these yummy transportation friendly options over at my friend Clara’s fabulous blog, Channeling Contessa. I am tempted to make all three of these! No.3 If the thought of cooking makes you a nervous wreck, don’t just pick up a bag of chips and six pack and call it a day. Call the host and simply say you would love to bring something, but am not feeling the kitchen these days, how else can I help? Hope you have a fabulous weekend and Happy Fourth of July!